It should come as no surprise to any of you that I write a lot. It also should come as no surprise that I think a lot. Put those two together, and you get a prolific over-thinker. So when Jacqui introduced our class to literary forensics last week, I found a new pastime. The crux of the practice is to identify specific places in your writing where you can improve, little by little. You pick a part of speech, such as verbs or clauses or quote use, and mark it in unedited drafts to get a sense of how you use it. The more you do this, the better you get to know your writing. I see it as a way to get into the editing process with a very sharp focus, which is a little different from how I normally edit. Usually, I prefer to macro edit first. And while I don’t think that’s a bad idea, it does mean that I don’t leave as much time for micro-editing. This semester is all about doing what’s hardest for me writing-wise, so I figure it’s good to shake up my writing and editing practices. Verbs (green): I need to choose verbs with more action and fewer “ings.” I also use to many helping verbs and state of being verbs. I think I could do this better if I wrote with more scenes and action. It’s hard to describe ideas and concepts that don’t do anything. Dependent clauses (purple): My tendency is to begin sentences with them, but fortunately those aren’t always sentences that start paragraphs. Jacqui told us these types of sentences slow down the pace of a story, and that’s the last think I need. Mostly, I use dependent clauses to mark chronology, which in the case of the narrative I was using, made sense here. Adjectives/Adverbs (blue): Put bluntly, they’re too boring and too few and far between. I rely on “more,” “less,” “new,” and clinical words like “effective” and “proficient.” I need to add color and get away from just describing size. Quotes (red): In these drafts, my use of quotes is pretty good. 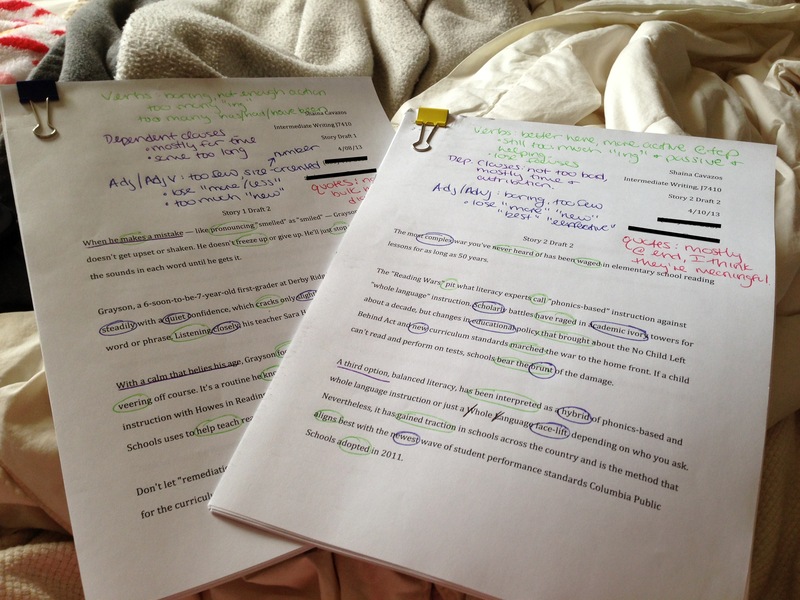 In ones I edited in Jacqui’s class, however, I kept falling into that paragraph-quote-paragraph-quote trap. Jacqui said this can be symptomatic of writing too much or not knowing enough about your subject. As I write this now, I am constantly self-editing. Literary forensics is a habit I could get used to and one I think will help me clearly identify what I need to change and why. I think a lot about what I’ve learned. I’ve worked so hard to be a better, freer writer this semester, and it’s exciting to find ways to make that happen. Part of that has been an exercise in confidence, in myself and in my writing. And part of it has been learning the tools to help an explanatory reporter and writer dabble in narrative journalism. Starting out in this class, I didn’t think I could do this kind of reporting. But I made a promise to myself to make the harder choices and do what I was nervous about. It’s been hard to try to imagine how this would all play out, how I’d put these drafts together and do the interviews and write in a way that feels unnatural. But now, I’m proud.